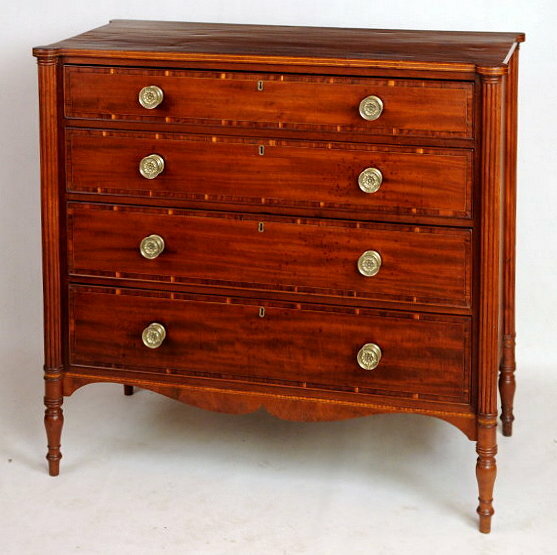 Very fine sheraton inlaid mahogany four drawer chest, with extruded cookie corners with string and crossbanded inlaid edge, above a case with four drawers having crossbanded, string inlaid and beaded edges, flanked by reeded columns ending in turned bulbous form legs, centering a shaped apron. Boston, Mass., circa 1810-15. School of John & Thomas Seymour. In fine original condition with apparently original hardware. 43 1/2" wide, 22" deep, 40 1/2" high.